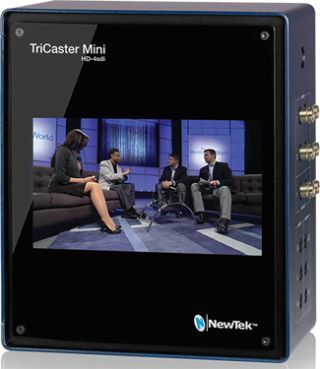 The NewTek TriCaster Mini HD-4 sdi, a compact multimedia studio now featuring HD-SDI hardware, gives users a choice between professional SDI I/O and the HDMI version of TriCaster Mini, broadening the scope for professionals to transform presentations into engaging multimedia content that looks like network-style TV. The TriCaster Mini’s compact size, simplicity, and feature set are designed to make it easy to carry in one hand, set up, create, and share a complete program in a matter of minutes. Broadcasters and video professionals who add the TriCaster Mini to their toolboxes can produce multi-camera content using SDI cameras without adding adapters to convert to HDMI, creating video coverage with longer cable runs than possible with HDMI, and with BNC connections that lock in place. “The SDI version of TriCaster Mini is a direct response to feedback we’ve received from SDI camera owners who like the form factor and small size coupled with its comprehensive capabilities,” said Dr. Andrew Cross, president and CTO at NewTek. The TriCaster Mini HD-4 sdi will be on display at the NewTek IBC stand 7.K11 in Amsterdam, from September 11-15.